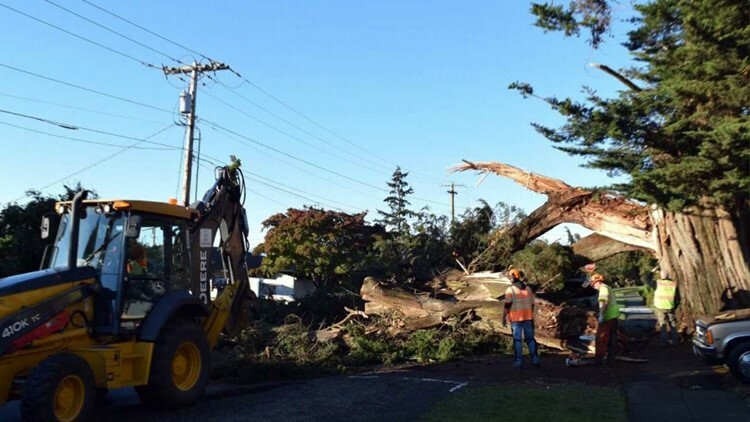 A massive Monterey cypress tree in Port Townsend that can be seen from miles away must be cut down. An arborist with the University of Washington says the tree is rotting from the inside and is a danger to neighbors. It has towered over the historic town of Port Townsend for generations -- a landmark that can be seen for miles. But now, its days are numbered. At 60-feet-tall and more than 33-feet-around, it is the biggest Monterey cypress tree in the state of Washington. "There are so many mourners for this tree," said Lucia Hardy. "It meant so much to all of us." About 1/3rd of the massive tree came crashing down last week, out of nowhere. It damaged three cars, smashing all of their windshields. "I never thought I'd have to worry about it," said John Eissinger. "I thought it would just keep growing." The tree has stood just outside Eissinger's Blue Gull Bed and Breakfast for 150 years. It can be seen miles away in Puget Sound as ferry passengers cross from Coupeville. "We get a lot of people who come by and pet the tree, hug the tree," said Eissinger. The tree is about as old as Port Townsend itself. Since the crash last week, neighbors have been leaving flowers and keepsakes in its damaged trunk. Lucia Hardy tacked up part of a poem by W.H. Auden. "The stars are not wanted now, put out every one," it reads. "Pack up the moon and dismantle the sun. Silence the pianos and with muffled drum, bring out the coffin, let the mourners come." Hardy recites it like a eulogy for an old friend. "It's such a huge loss," she said choking back tears. Next to that poem, however, is now an email from a University of Washington arborist. The note says the tree is rotting from the inside, unbalanced, and a danger to neighbors. Eissinger must, reluctantly, take it down. I'm not excited about it," he said. "It'll be way different, but that's just what's gonna have to happen." Eissinger plans to keep a big chunk of the trunk and turn it into a bench so people can continue to enjoy what their beloved tree can still offer. For so many, though, things will never quite be the same atop Port Townsend. "It was the first thing we looked at in the morning and the last thing at night," said Hardy. "It's so sad to see it go."